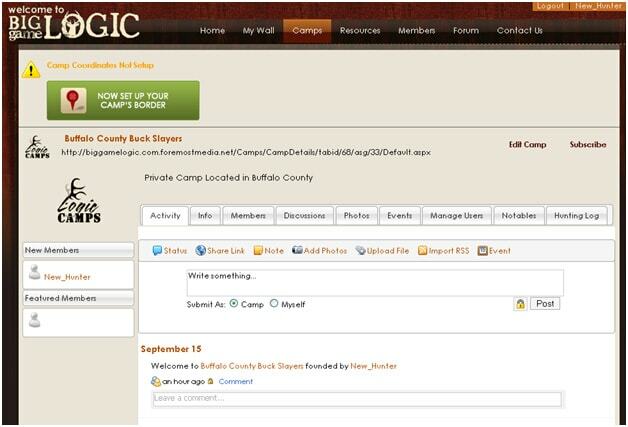 BGL Basics: How Do I Create a Camp? Once you are logged in you can create your own camp. To do this, click on the “Create New Camp” text as seen below. Open = Open to all public. Any member of BGL can access your camp and view your data. Closed = Open to only camp members invited to your family. The camp can be seen on the camp list and anybody can ASK to join but can’t join unless the creator accepts. Creator can also invite other in. No data can be seen by non-members of the camp. Even though they are not listed as required, make sure you at least enter a City and State. This will be used when you first create your map for your camp. The map will initially zoom into this location to ease you in your search. Once you have finished your camp creation, you will be taken to your camp.